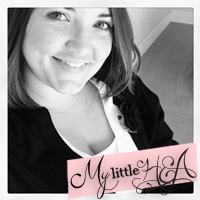 My Little HEA: Happy Five on Friday! Well it's Friday and while I'm excited for the weekend, I have a lot of things to get done between now and brunch tomorrow morning! 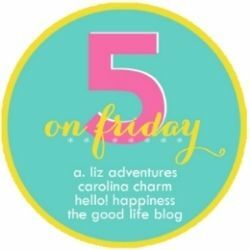 I'm linking up for the Friday Five with A. Liz Adventures and some other girls for my end of the week show down! I hate being a procrastinator, but most of my best stuff comes when I'm under that time crunch! Seriously...all of my papers in college were written the morning of the day they were due. It's a sickness I tell ya! I'm really looking to this weekend. It won't be long enough, for sure but hopefully I won't be super exhausted after St. Patrick's Day on Monday night...since I have to work Monday boo! I wish all Holidays were a day off. :) This is one of my green items I'll be sportin' over the weekend! 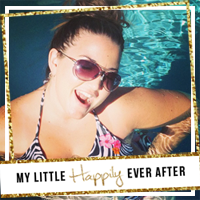 I had some pretty good posts this week I want to make sure you read. 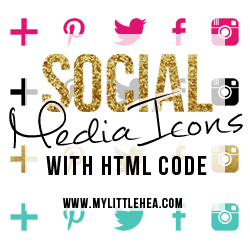 Especially, when I talked about my early read of Maybe Someday which releases March 18th and when I shared some Social Media Icons for your sidebar! I got paired up with some great ladies for the Cara Box exchange this time around. Hey Charlene and Bekah! I'm loving getting to know these girls and it's only the first week! I mentioned that the girls I've sponsored this month have really set the precedent high and I wanted to let you know you could check them out in my sidebar of course! Kerry, Erin, Kate and Stephanie - thanks for being awesome girls! Kate and Stephanie have both been great about the Social Media Love and I'm very excited to be in one of Erin's posts after I get her my information. Each girl has really lived up to what they promised in their "ad" and while of course they should, not all do... Kerry and I swapped sidebars and if you're interested in swapping sidebars with me too, hit me up! I'm just really full of love today and my work attitude has been so much better since I've tried not to take things personally and be the best, nicest me I possibly can. I also only had to work two days this week so that may have something to do with it too, haha! I heard the Selfie song for the first time today and it made me think of Barbie Girl...anybody else? Both sky rocketing to the top and I'm not sure why other than they're kinda catchy? Seriously, Bobby Bones said it was the #1 most downloaded song on iTunes this week. Crazy! Thanks for the heads up about the sponsors....I've only had one that really worked out well the other ones were let's call them.....rude? Definitely have to check them out! Steph & Kate are both great to sponsor! I love that green hat on you. I am not the happiest at my day job, but recently just chaged my attitude and things have improved a ton! Glad you discovered that trick, too! 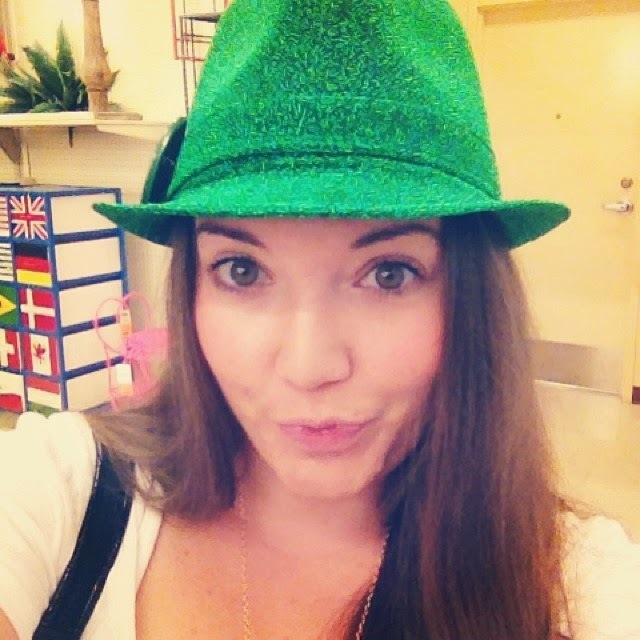 Love the green hat for St Patty's day. Kate and Steph were both great for me too. Thanks for the love! Happy Friday. I heard that song Selfie the other day and totally cracked up. I can picture a group of girls I know saying every single thing they say in the song! Right before selfie came out, we were in the same bar together and I was hanging out with them for awhile - they are JUST as crazy as the song makes them seem! haha I don't think they had any idea they were about to be superstars! Thanks for the shout out girl! Ugh I am such a procrastinator too! Aw good, I'm glad you're enjoying your month! If you ever need anything else, just let me know ;) I love that green hat!! Steph is a GREAT sponsor... just got done with my month with her and I'll definitely be going back for more in the future!